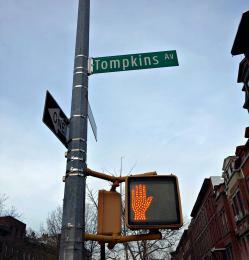 I live on “Black Girl Magic” Street also known as Tompkins Ave in Brooklyn, NY. Why “Black Girl Magic” Street? Because a total of 15! Black Women have opened their businesses here in the last couple of years and added huge value and a great vibe to the block. When I moved here a couple of years ago, it was already a great street to live on, but if you wanted anything a Bodega didn’t offer, you were out of luck. Now, you can shop the most elaborate designs, accessories and interior items on Tompkins Ave, get an acupuncture as well as an almond latte and a croissant. And please don’t misread this as a celebration of gentrification. No, this is a celebration of black women with an entrepreneurial spirit who have the guts and vision to open a business. It is motivating and empowering to see all these businesses popping up on my street that are all run by black women. Variety of fashion accessories and clothing Made in Nigeria. Calabar Imports has three stores across Brooklyn and New York. Concept store focused on “emerging lifestyle brands and womenswear”. The boutique has a coffee store and hang-out area in the front. TNT is another beautiful concept store on Tompkins Ave, that showcases also designs from the African Continent. The store is a “creative partnership of The Narativ and the Trendcue Pop Shop, “bridging the world of contemporary & luxury design, art, travel, & culture”. Beautiful, zen place to get a massage or an acupuncture as well as buy products for your body & skin and hair. The Life Wellness Center has a great backyard where they host Yoga classes as well as other events in Summer. I love that so many of the shops were created by a group of women – combining their creative energy and entrepreneurial spirit. 4 women got together to found the store Radical Women. Have a peek in their rest room to see the wall of radical women that inspire these four ladies. Stop by for natural beauty products, handmade hats, jewelry, canvas bags and clothing. Designer and stylist of celebrities like Erykah Badu, you can find Ashaka’s gorgeous handmade hats and caps made out of fur and wool at the Radical Women shop. Look at all these amazing colors! Custom-made leather and canvas totes that are handmade in Brooklyn. Check-out the fun “Hat Lady Bag Tote”. Bold print bags like sling bags, messenger bags and pouches in different sizes and forms. Apparel and natural beauty products like a purple vegan lipstick – everything is unisex and natural. Interior Design, interior accessory and furniture store. Spacious store that also has a kids area and a lot of fun and unique accessories that make great birthday gifts. Peace & Riot has a shop in shop concept and houses the clothing brand IndigoStyle Vintage and the jewelry brand Mary’s Hands Jewelry. Great spot to find fashion forward, vintage, indie and retro clothing & accessories. That’s where I saw the AfroPunk-ready Black Girl Magic bag. Follow them on instagram to get inspired how to combine different vintage pieces. Handmade jewelry shop inside Peace & Riot. Come here for custom-made jewelry and stylish statement necklaces and rings like the Brooklyn necklace below (want!). After all the shopping on Black Girl Magic Street – go and have a bite at Brown Butter, on the corner of Hancock Street. It is more of a Cafe, but they also serve wine & food on some Thursday nights. Last but not least, my private storage and office for my blog and online platform www.africaboutik.us is on Tompkins Ave, too! So next time you are in Bedstuy, make sure to stop by “Black Girl Magic Street”. As you can see, it is totally worth it.